Good morning earth! 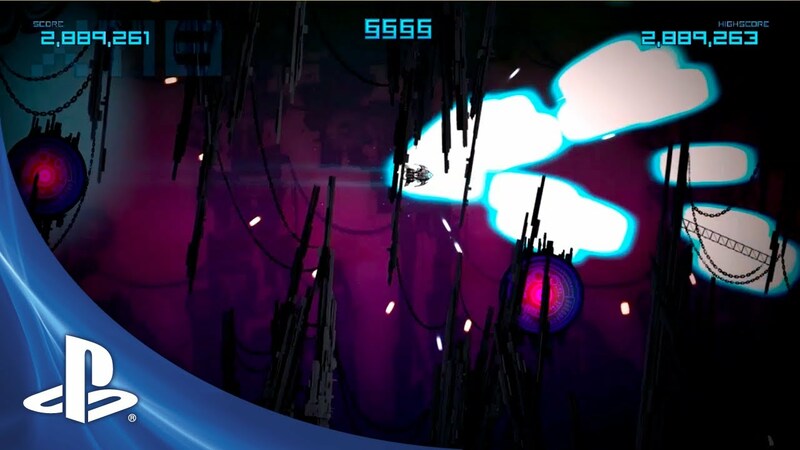 My name’s James Whitehead, I’m the boss at Boss Baddie and I’m here to talk about our twin-stick shooter Big Sky Infinity, coming to PS3 and PS Vita with today’s PSN update. Buy it on one system for $9.99, and unlock the other version at no additional cost! 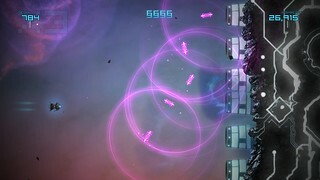 Big Sky Infinity is a lightning-fast, randomly-generated game that adapts to how you play – it’s never the same game twice! You pilot a spaceship that’s flying straight into an alien armada. The further you progress, the harder it gets, with giant bosses, streams of enemies and special things we call ‘Events’. Your ship is equipped with a drill that lets you smash through planets and meteors. It’s less about memorisation and more about reactions and adapting! There are a whole slew of game modes that you’ll unlock as you play. You’ll start off with Classic Mode – the real bones of the game. Here you’ll start off with a paltry little spaceship that can barely dent a tractor, let alone alien spacecraft. 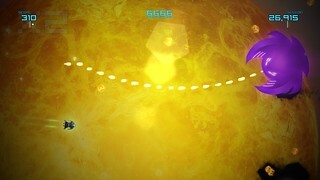 Destroying enemies will cause them to drop little starbits which are spent upgrading your ship. Pretty soon you’ll have the most splendid spaceship this side of Jupiter. But the stronger your ship gets and the longer you last, the tougher the bad guys will be! You’ll unlock other modes, such as Nightmare – the complete opposite of a walk in the park. Then there’s Pacifism, where your laser cannons have been jammed with flowers. And we’ve got an endurance-style mode for Infinity too! We’re utilizing unique aspects of PS3 and PS Vita for our multiplayer modes. On PS3 you’re able to play with up to three friends (or enemies, frenemies or relatives). It’s chaotic fun – you can help each other out by sticking together to power-up each other’s weapons, or compete to get the most points. 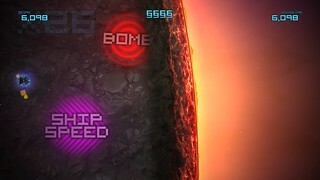 On PS Vita we have an asynchronous multiplayer mode, where you can challenge PSN friends (or randoms!) to take on your high scores in a turn-by-turn series of matches. We had a lot of fun playing this mode during development! Finally, we have these things called Events. Now, events are crazy, gameplay-shifting happenings that occur every so often, and when you get very good some will happen at the same time! My personal favorite is the Black Hole event. I won’t spoil what happens, but it would make for a great B-movie plot. 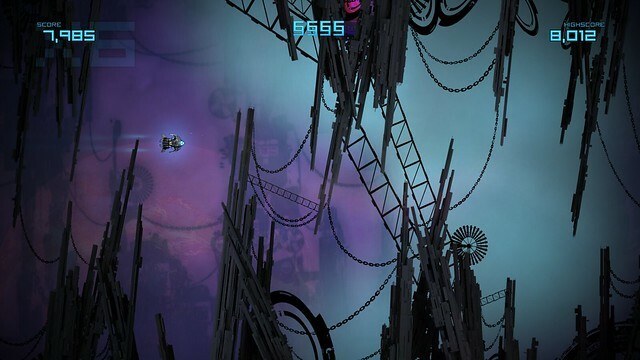 But there’s also the Worm Hole event, where you’ll tear through the fabric of space in a swirling vortex. 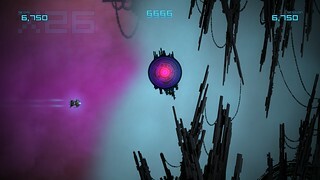 And look out for Hell Cascade, where bad guys get bored of not shooting lasers at you, and decide to do just that. There’s a lot to see and do in Big Sky Infinity, from the screen-filling, ever-changing bosses, to the gameplay-altering events, to the cheeky cockney narrator. We hope to see you on the leaderboards when PSN updates later today! I’m afraid it’s only slated to be free for Plus members in EU. That trailer you may have seen around was for EU use only. This looks insane. I’m into it! Too Bad For Sony I’m Not Buying ANYTHING from Playstation until they FIX THE D*** STORE! Everyone else should do the same. Get a store that works (or the old store back, even if temporary) by not giving them any money until they fix it. Is there cross-save/cross-trophy unlock for this game? I really wish this was free for plus members like it said in the video. I don’t think I can drop cash on it though because of the false advertising. It should be honored and given to us free since its Sony’s mistake. I wasn’t sure about this game and hadn’t read much on it, but the video looks good. What sold me on it was the randomly generated gameplay and cross-buy for PS3/Vita. I’ll probably play more on Vita, but it’s nice to have the option for me and the kids to play together on the PS3 too. Is the PS3 multiplayer same screen only or online as well? I personally have no interest in stick shooters, but i was wondering why you were giving this game free to EU plus members but charging NA? Awesome, I love Shmup games, will buy. And thanks again for bringing it to the vita with cross buy. 10$ sounds about right. I for one have no problem dropping a Hamilton for a good game. Lighten up folks. Cross-buy = instant-buy for me! Sort of bitter about the trailer to only find out that EU PS+ is again the superior version. I love Shumps, but I’m going to hold out unfortunately. Sorry, but I’m going to wait it out. Sony Americas continues the path of fail, EU gets a great holiday sale, we will get the same old games on sale over and over. I’m sure the publishers have some of the blame, but Sony surely can approach companies with evidence that sales will increase their income. I should add, my end commentary isn’t about free games, it’s about having a sale. Of course free is a great price, but 50%-90% off is better in some respects. I get to keep the game and give money to Sony and the publisher. Sadly, “Why won’t you take my money”, starts to make sense on why people say it here. I think US plus is great, I’ve been a supporter in the Plus updates, and I’m not comparing it to EU Plus. Yet, it is frustrating, and you guys should understand the annoyance people experience, when you post something and then say it’s going to EU and not us. For that sole reason, and I don’t care how good the game is, I won’t be buying this with my money. @4 You are correct. Store is a maze and navigating before, during, and after purchase is a mess. On another note, the game looks great. I’ll wait till it’s free though. I will be buying this game because of cross-buy. I’m jealous of EU’s + update. So the EU PS+ members get this free? Along w/ a Christmas game sale, PS+ membership subscription sale, and a much better games selection the past few months? Sony might as well go ahead and cancel the US PS+ plan now b/c I foresee people not renewing and less new people signing up. I’ve been a PS+ member since the first week – took me a few days to get to the store to buy a card – but I’m not renewing next month. (I was away for the holidays for a couple of weeks last year and renewed when we got back home). At the very least can SCEA at least remove the EU blog link from the middle of the top of the page, I swear it keeps sticking it’s tongue out at me and making raspberry noises. @22 rjejr – Yeah this is getting ridiculous about every week there’s a typo or something wrong in post in here. 2 weeks ago there was the Bejeweled 2 discount that was supposed to be PS3 version but was PSP, and now it’s wrong video region… this is B.S. Anyway i’m not beleiving anything until the store update is posted now. I won’t be a cheap skate like the other here. I’m getting this! @26 GhostMachine1 – Not saying i won’t be getting it, just that it was announced as free for + US but it’s not. When the game was first unveiled, every news outlet stated it would be part of the instant game collection for PS+, never stating that it was for EU PS+ only. It may not be Boss Baddie’s fault for the misinformation, but that should have been addressed at the time instead of waiting until now to let us know. That’s poor press and community communication. I’m not saying that game isn’t worth the $10, but I for one will not be buying it, hoping it comes to the US PS+. If press is reporting something incorrectly, it’s the developer and/or publisher’s job to set them straight and clear things up ASAP, not wait until release. In this day and age of instant-communication, that is unacceptable. Heh at this point it’d be easier to count the number of store related Blog posts in the past 6 months that haven’t had errors, than to try and total up all of the ones with typos, wrong prices, wrong info, false advertising (just because you put in the wrong info doesn’t change that it was advertised and false). Personally I have no interest in this game, but it’s interesting to see yet another comment section fill up with complaints about Plus, the TERRIBLE new store, and the constant errors and false information in the Blog posts. This one looks quite interesting. If the gameplay is as awesome as the art style, I’m sold. Too bad about the mistake about it being free for plus. I’m afraid that’s going to hurt the sales of this game. I hope I’m wrong, because cross-buy for $10 is quite amazing. Well i’m glad to see more games coming out for PS Vita, because the system needs some serious 3rd party backing & original IP’s. Will get, just have this feeling it will be free for plus in the next month or two. Oh well it’s a great deal, can’t dwell on it. SOLD! @8, I agree with you. I’m not going to buy it either for that very reason. Whether it was a mistake or not, in the end, it is false advertizing. If you walked into any retail store, and find anything mismarked, then the store has to sell it to you at the marked price. Why should the PlayStation Store be any different? It isn’t like giving this game for free is going to put that significant a dent into Sony’s profit margins for the month. You guys really need to step up your game. I understand mistakes happen sometimes but it’s been every single week for who knows how long. You are all suppose to be professionals that’s why they pay you to do it. Is that a song made for the game? Can I acquire it elsewhere so that I may bathe my cochleas in that sweet symphony of sound? The mistake turned out to be the worst promotion….I really feel sorry for everybody involving development of this game. $10 is a bargen for this type of twin-stick shooter, indeed. But after giving false hope for IGC, any price won’t work for PS+ member. Honestly, even I feel some hesitation to click the purchase button for it. so we pay $10 so our friends at europe get it for free?? sweet what a deal. seriously though ive been a plus member since day one!! ive been waiting to renew but us plus is gone really really bad…im not saying give us brand new games for free all the time but at least after a month has passed we deserve a discount on the games. i was going to buy this without thinking but once i heard its free for eu plu..you can kiss my $10 good bye. to the people saying its just $10, if you like to spend your money like an idiot then go ahead. Free for Europe = why should i pay? With the blatant advertising screw up this really should be made free to all plus subscribers. Otherwise it relly harms my faith in an already doubtful system. i purchased Big Sky Infinity on my ps3(both versions), the ps3 version is fine, but if i try to copy the Vita version of Big Sky Infinity from the ps3 to the vita it doesnt work and its giving me a C2-12383-7 error. i also tried to download the vita version from the Download List directly on my ps vita but without success. i also noticed that i cant download it from the Vita ps store since its like if i didnt purchased the game and asking me to buy it again. looking foward to some explanations to resolve the obvious problem. Exactly same error of #45 here. And it’s taking forever to sync the one trophy I got in the PS3 version. I think it’s great that people are finally wising up. Sony needs to learn how to treat it’s customers. They make mistakes EVERY single week with pricing, downloads not working, people getting charged for things that should be free, dlc not working, games disappearing from people’s download list, false advertising, and on and on. The most they do is make excuses and give false, delayed apologies. They need to lose customers, and they already lost plenty of my business over the past couple of months. Unfortunately, I had to break down this week and buy Black Knight Sword. That game demo was just waaay too much fun and Suda51 is awesome so I couldn’t resist. A few months back, this game would have probably been a buy for me. ..I hope developers also take note and start realizing that Sony is directly responsible for lost sales of their games. @Misantropus they are looking at the problem right now, hopefully they will fix it asap. Sine Mora $9.99 AND way much better .